An effective and less expensive tool for the inspection of food and drugs could soon be a reality. Scientists from the Fritz Haber Institute of the Max Planck Society in Berlin have been working with national and international partners to develop a conceptually new source of terahertz radiation. The innovation makes it much easier to generate this radiation, which is well suited to the analysis of soft materials and could therefore be more widely used in the food and pharmaceutical industry in future. Terahertz waves lie in the frequency range between from about 0.3 to 30 terahertz in the electromagnetic spectrum - between microwaves and infrared light. They are useful for analyzing organic materials, as they can penetrate things like textiles and plastics while also being characteristically absorbed by many pharmaceuticals. Unlike X-rays or other sources of radiation, terahertz radiation is also completely harmless for the body. "Our method of generating terahertz radiation makes applications possible that were previously too costly for such sources," says Tobias Kampfrath, leader of the Terahertz Physics Research Group at the Fritz Haber Institute, which spearheaded the development process. The terahertz source which Kampfrath's team and their partners in Mainz, Greifswald and Jülich, as well as in the US, Sweden and France, have now presented is the first to generate the entire bandwidth of terahertz radiation at relatively low cost. This could be extremely useful for the inspection of food and drugs, as analyses with broadband terahertz radiation target numerous substances and thus deliver more meaningful results. Currently, equipment which can generate the entire spectrum of terahertz radiation is still big and expensive, as it relies on very powerful lasers. "Our emitter generates the entire spectrum from 1 to 30 terahertz and is therefore also suitable for use as a table-top emitter. Not only that; it is more energy efficient, easier to operate and cheaper to manufacture than former sources," according to Tom Seifert, doctoral student at the Fritz Haber Institute. "We anticipate that it will quickly find use on a broad basis." The source is powered by a compact femtosecond laser, which generates 80 million ultrashort flashes of light per second. It excites the actual emitter, which resembles a solar cell. However, it consists of two metal layers, one magnetic and one non-magnetic, each just three nanometers thick, which are grown on a glass substrate. When an ultrashort laser pulse hits the material, it generates a current burst, turning the metallic bilayer into a type of antenna emitting electromagnetic waves with terahertz frequencies. 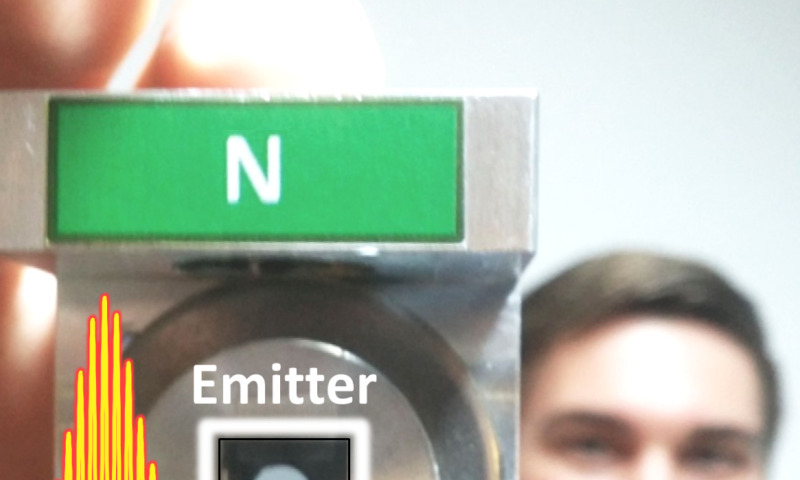 "The emitter works so well because, in addition to the charge of the flowing electrons, we also use their spin," explains Tom Seifert. 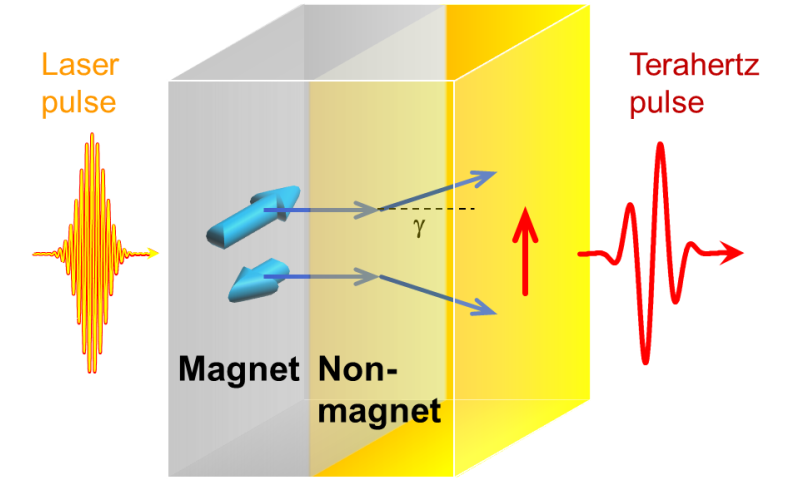 The spin of an electron is a magnetic property which can have two distinct values. It causes the current to behave differently in magnetic than in non-magnetic metals. First, the laser light excites different numbers of electrons with the two possible spin directions in the magnetic layer. Then, the current flows into the non-magnetic layer, where the electrons are deflected into opposite directions depending on their spin. This produces a current perpendicular to the electrons' original direction of movement. It is precisely this current burst that then generates the terahertz pulse. Eventually, because the metallic bilayer is extremely thin, the electromagnetic radiation is barely weakened at all on its way out of the metal, as would be the case in a thicker layer.